The field of health care administration combines the clinical aspects of patient care with the strategies of business management. Administrators are responsible for the nuts and bolts of running health care facilities, all with an eye to the factors that impact patient health. Students in HCA degree programs delve into subjects such as health care finance and economics, organizational behavior and management, business ethics, health policy, epidemiology, and health care marketing, acquiring the skills and knowledge they’ll need to make decisions that affect staff and patients alike. This guide discusses the health care management field, including educational options, job prospects, and key skills. Continue reading to learn more. Whether students are studying at the undergraduate level or are interested in finding a post-baccalaureate program, the selection of schools offering programs in healthcare administration are numerous. 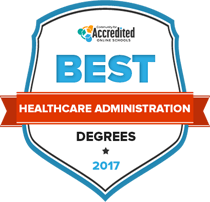 We know how important it is to find the school that will best fit your educational needs: that’s why we’ve compiled a list of the country’s top schools that offer degrees in healthcare administration. Our findings are derived from specific data points that we focus on for each institution, including class sizes, graduation rates, and overall grade point average. Check out below to find the best 2017 healthcare administration programs. Choosing the right health care administration school is no small task. Students can choose from traditional, online or hybrid programs, as well as different degree levels. It’s imperative for them to thoroughly research programs to find ones that align with their particular goals and preferences. The search tool below allows prospective students to find programs based on several criteria—including location, cost, school type and student population — allowing for a side-by-side comparison. Health care administration programs offer degrees at both the undergraduate and graduate levels. Those eager to join the workforce in an entry-level capacity—as a medical billing clerk or medical records technician, for example—can receive the necessary training from an associate degree program. Students with an eye to middle management positions generally earn bachelor’s degrees, while those who want careers at the executive level can pursue a master’s. Doctoral degrees in health care administration are also available for students interested in research and teaching careers. The U.S. health care system is vast and complex, and hundreds of thousands of people work in various administrative capacities in both the public and private sectors. Health care administrators are charged with overseeing the daily operations of a health care facility or related business, from managing a specific department or team to heading up an entire health care organization. While health care administrators are not responsible for direct patient care, their decisions nonetheless have a tremendous impact on health outcomes. Health care administrators, also known as medical and health services managers, work in a variety of settings, from hospitals to doctors’ offices to nursing homes. They are often responsible for managing employees, including recruiting, hiring and training, as well as supervising the daily activities of workers. Administrators also manage the operations of medical facilities, a job that involves a wide range of duties such as creating and monitoring budgets, setting goals for each department of an organization, and examining the facility’s health care services and targeting areas for improvement. Administrators must also keep abreast of government policies to ensure compliance with any legal requirements. While health care administrators often work for a medical facility, it’s not the only avenue. Their skills are also highly applicable in related fields such as insurance, health care consulting, and biotechnology and pharmaceuticals. The U.S. Bureau of Labor Statistics projects employment for medical and health services managers to increase by 17 percent in the coming years, making it an ideal time to earn a degree in health care administration. These credentials can be earned on the certificate, associate, bachelor’s, master’s, and doctoral levels, giving students progressive amounts of education and training should they choose to seek more advanced positions. This section explores the degree options for health care administration students, and the kinds of jobs they lead to. Whether students want to climb the ladder to a managerial position in health care, or move horizontally to apply their existing management skills to a health care administration job, a certificate program can arm them with the business and management skills necessary in a health care setting. Medical receptionists are on the front lines of a health care facility, responsible for the first impressions patients get when they walk through the door. These professionals are charged with managing the activities of the front desk, including scheduling appointments and guiding patients through the check-in process. Other responsibilities may include support duties such as handling phone calls and filing patient records. Medical office managers are responsible for overseeing administrative functions in a health care facility, from supervising staff to handling tasks in accounting, billing and medical coding. These professionals may work in a single location or be in charge of multiple ones. Clinical managers attend to the nuts and bolts of an individual department or an entire medical care facility by supervising the activities of clinical, administrative and clerical staff members. The job entails duties such as hiring, monitoring budgets, making purchasing decisions, and setting overall policies. Usually drawing on a medical background, clinical managers can work in a variety of settings, including hospitals and clinics. An associate degree in health care administration is a good starting point for those looking to enter the industry. The curriculum is designed to train graduates to take entry-level positions at hospitals, medical clinics, doctors’ offices, and insurance companies. Students gain familiarity with medical terminology, basic accounting, medical coding, anatomy and physiology, and medical office management. Medical administrative assistants are instrumental in ensuring that health care facilities run efficiently. Some of their duties include scheduling patient appointments, processing insurance claims, maintaining patient records, answering phones, obtaining medical histories before patients see a physician, and ordering office supplies. Using their knowledge of coding and billing procedures, accounting, and medical technology, medical billing clerks handle the billing processes at doctor’s offices or hospitals. Specific job duties include gathering information about procedures and tests to determine the overall amount of a bill, as well as processing insurance claims. Medical records technicians certify that medical records are accurate and that the appropriate codes are applied to bills when presented to insurance companies for payment. They must keep patient information accurate, complete and confidential. Bachelor’s degrees in health care administration are tailored to those interested in middle-management careers. These degree programs provide in-depth information in subjects such as health care policy, medical information systems, insurance reimbursement, business ethics, epidemiology, and health care quality management. Working closely with higher-level managers, assistant administrators typically manage a specific area within a health care facility, such as medical records or nursing, as well as run some of the day-to-day activities. Maintaining accurate invoices and handling collections issues are among the responsibilities of billing managers. Human resources managers ascertain the staffing needs of a company, work to attract and hire the best talent, and train new employees. In addition, they create and maintain employee benefit programs, mediate disputes between staff members, and establish policies about workplace issues such as sexual harassment and discrimination. Students in master’s degree programs in health care administration get advanced training in a specific subsection of the discipline. Concentrations include finance, project management, human resource management, public health, policy and management, and information technology. To learn more about earning a master’s in health care administration, see our guide. Nursing home administrators manage the day-to-day operations of long-term care facilities. Their responsibilities include budgeting, financial planning, marketing and staffing. Fundraising functions in a health care institution are handled by directors of development, who work to establish a donor base and solicit them for funds; implement fundraising campaigns; and identify funding sources such as grants and corporate investors. Major decisions that impact the quality of patient care and the operations of a facility happen at the executive level. Work involves creating budgets, attending board meetings, and creating procedures for emergency situations. Health care administration doctoral degrees are for those who want to achieve the highest level of expertise in the field and gain an exhaustive knowledge of a specific topic. Students may focus on subjects such as health care law and policy, medical economics, organizational theory, and management science. Working for government agencies, universities, and large hospitals, public policy researchers and fellows create and conduct studies about the health care industry. Health care advocates conduct research and work to influence policy that impacts patient care. They may be employed at hospitals, colleges and government institutions..
Health care administration faculty members help to shape the future of the field by training its next leaders. In addition to teaching specific courses, they may work to create overall curricular standards and expectations, and may also conduct their own original research. Evolving technologies and policies are transforming the health care industry, with some career paths experiencing substantial growth. Following are examples of common careers that graduates can pursue, along with information on their salary and growth potential. Direct an organization’s staffing activities, from recruiting to resolving employee conflicts. Responsible for the operations and staff at social service agencies and community programs. Keep the skills and knowledge of a workforce current by overseeing training and development activities. Manage the support services and staff of an organization. Charged with maintaining patient records, processing claims, and ensuring that medical coding is done accurately. Help ensure medical clinics run effectively by planning, managing and overseeing medical and health services. They are also responsible for making changes in response to evolving healthcare laws, regulations and technology. In addition to the textbook knowledge gained through earning a degree in health care administration, students must cultivate a number of key skills to ensure success in the field. To ensure patients receive the best care, health care managers must maintain the budgets related to equipment, staffing, and operations, taking into account short-term and long-term needs, as well as unforeseen expenses. Tempers can run high in any workplace, and with the high stakes in medical settings, it's not uncommon for conflicts to arise among stressed employees. Managers must be able to defuse these conflicts effectively, administer any necessary discipline, and look for solutions to minimize future problems. Health care managers are in charge of many aspects of an organization, and must make decisions on a range of issues, from ordering office supplies to determining how nurses perform specific procedures on patients. They must assess whatever information is relevant, and often must make decisions quickly to avert or resolve problems. From scheduling to budgeting, there are a lot of minutiae involved in running a medical clinic. Administrators must be detail-oriented to avoid confusion and make sure nothing falls through the cracks. Health care management requires strong interpersonal skills that facilitate working with different kinds of people, from subordinates to higher management and other stakeholders in the health care process. Just like its medical counterpart, administrative health care technology is always being updated to improve quality of care, and health care managers need expertise in the different kinds of technologies used at medical facilities, such as billing and coding software and electronic health records programs. Health care managers must keep abreast of the rapidly changing laws that affect the field. It's imperative for them to thoroughly understand legislation that impacts patient care, as well as various policies that dictate how health care facilities operate. Health care managers must be able to communicate effectively with employees, other members of management, patients, the board of directors, and sometimes the public. They should know how to speak and write in ways that are accessible and appropriate for a variety of audiences. Represents the interests of health care administrative managers by providing certifications and sponsoring professional events. Contributes to the success of health care administrators by offering mentoring services, professional development courses, and career resources. Provides services to health care information management professionals, such as conferences and certifications. This professional association is for those involved with the internal auditing processes of a health care organization, such as financial, information technology, compliance, and clinical auditing. Comprised of educators, professionals, and health care organizations that work to ensure health administration degree programs maintain high standards. Provides support and accredits schools that offer health care management degree programs. Provides professional development and resources to managers who work for third-party health care administrators, such as pharmacies, insurance companies, and consulting companies. Represents the needs of billing managers at health care facilities. Offers continuing education and professional development services to health care finance managers.